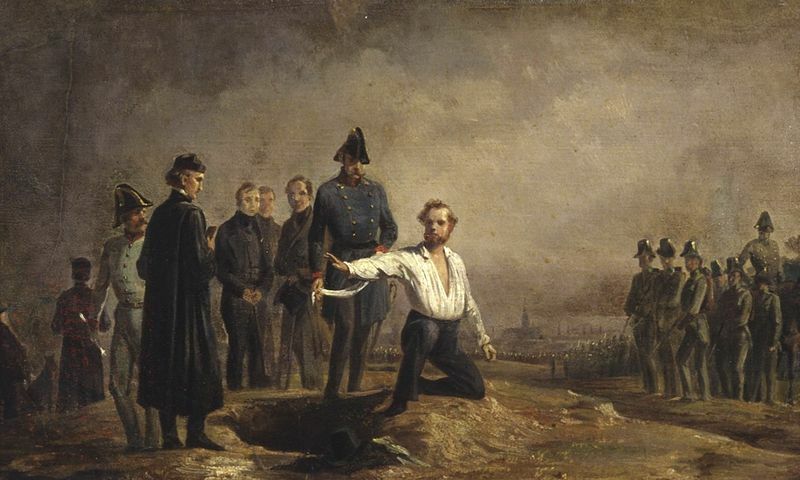 On this date in 1848, a day short of his forty-second birthday, the German revolutionist Robert Blum was summarily shot in Vienna — a tragic victim of Germany’s Revolutions of 1848. Marker at Robert Blum’s birthplace in Cologne reads “I die for the German liberty that I fought for. May the fatherland remember me.” (cc) image from Elke Wetzig. Blum grew up in a penniless proletarian family but drifted into the literary set. He spent the 1830s penning liberal-minded plays, poetry, newspaper correspondence. He uncovered a magnetic personality and a gift for organization. By the 1840s he was a — maybe the — preeminent left-liberal in the Kingdom of Saxony: pro-parliamentary democracy, anti-violence, for a wide grant of civil liberties and mass education. That pregnant year of 1848 found Blum in the Frankfurt parliament, and his neither-fish-nor-fowl leftism — a little too out there for mainstream liberals; a little too bourgeois for real radicals — made Blum the perfect pick for a solidarity mission. 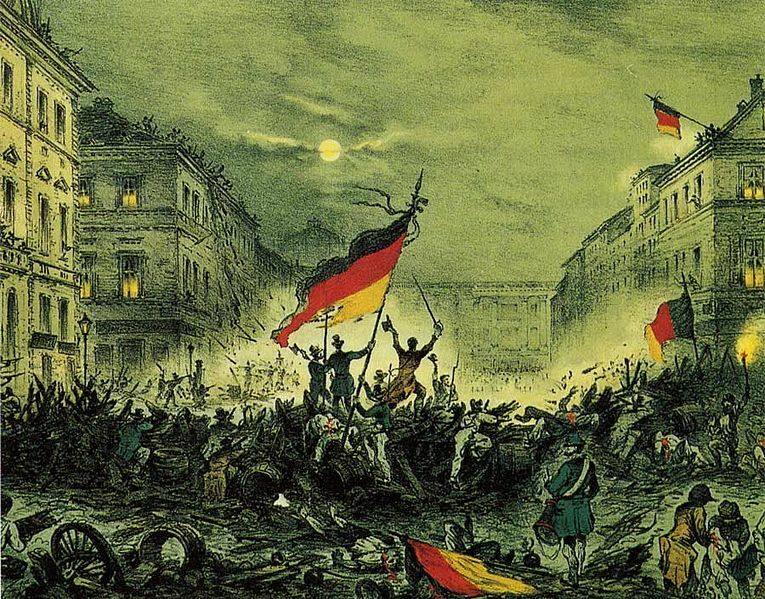 When in September 1848 the Austrian army was defeated trying to crush a Hungarian rebellion, the Habsburg capital of Vienna took the example and mounted a revolution of its own, putting the government to flight. Blum was sent as sympathetic delegate to this abortive Viennese commune, but found himself trapped in the city when the Austrian army encircled it in late October. 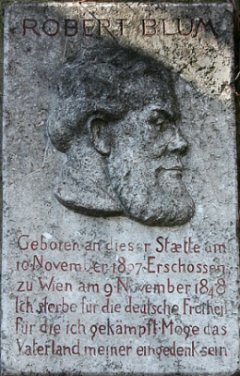 The Austrians, when they caught him, sent their own message back by denying him any form of deference for his parliamentary rank. 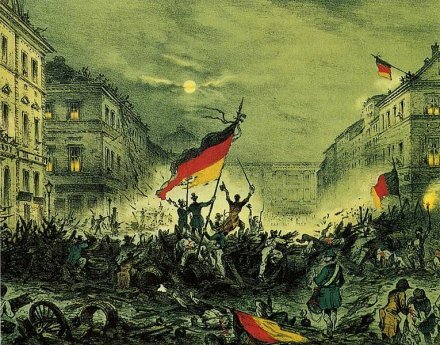 Blum’s direct condemnation was a stark warning by the Habsburg state to agitators, but also to their putative brethren dreaming of a Greater Germany. Austria wasn’t buying what the Großdeutsche people were selling. 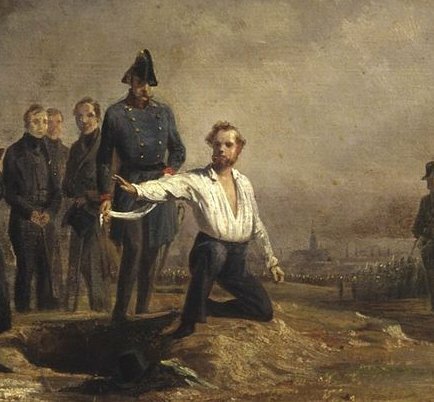 Detail view (click for the full image) of Carl Steffeck’s painting of Robert Blum’s execution. Here’s a YouTube recreation (in German). Blum went on to a posthumous career as a star liberal martyr among the German circles who had use for such a character. Blum’s seven-year-old son Hans grew up to follow his father’s literary footsteps … but from quite the other side of the aisle. He was a pro-Bismarck nationalist.